Hyperhidrosis is a condition in which a person sweats excessively. 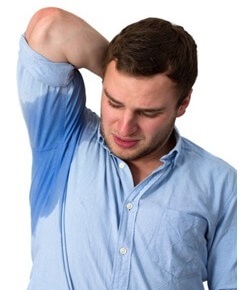 People who suffer from this excessive sweating can become very self-conscious and feel very embarrassed. Hyperhidrosis is a long term condition and it can seriously affect those who suffer from it. The sweating may affect the whole of your body, or it may only affect certain areas. The sweating doesn’t usually pose a serious threat to your health, but it can be embarrassing and distressing to those who suffer from it. It may also have a negative impact on your quality of life or lead to feelings of depression and anxiety. Hyperhidrosis (or excessive sweating) affects about 1% or 2% of the population and it can affect both men and women. If you know or think you suffer from it, you don’t have to anymore, because here at Aesthetics of Essex, we have a treatment that will help create a better quality of life and lessen the problem. We carry out a procedure – using Botulinum Toxin A Injections (also known as Botox) – to treat this condition. It is injected into the skin, to block nerve endings, so that no more sweat can be produced from the sweat glands in that particular area. The injections themselves are relatively quick and painless and the whole procedure takes just 30-45 minutes on average. Unfortunately, this is not a perfect solution, within 6 – 12 weeks; your body starts to produce new nerve endings, meaning that mild sweating will start to return. Then within 5-8 months, all of the new endings would have been produced, meaning that the sweating will return to normal. Therefore, further treatments for Hyperhidrosis may be required. It is an effective at reducing the symptoms of Hyperhidrosis, and giving you relief from the excessive sweating. Call us on 01708 225555 or contact us to book an appointment with our senior nurse, and discuss your Hyperhidrosis treatment.